I've never done a live blog before, but here it goes. A shame for D.C. United as they fall to Pachuca - 3-2 aggregate. Second half of the earlier game was great. At least they got that moral victory with the home leg win. Wow, I wish I was down in Costa Rica right now, that stadium looks like a great place to be - at least I can take some heart in knowing the FSC announcers aren't there either. Houston wasn't able to score during the home leg, but they kept Saprissa from scoring too. So a clean slate for both teams. I should note that this game is on a bit of delay. So . . .
Artifical surface in Costa Rica, so what do the Anglo snobs have to say about that?? Dag, looks like Waibel is injured. Both Boswell and Robinson are out tonight - the back line needs some help from the middle. Brian Mullan is in now . . .
Easy, but nice stop for Caig who looked so rusty on Sunday. 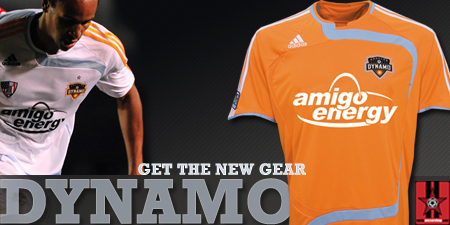 Once again Caig comes through for the Dynamo. Lucky break in the 13th minute for Dynamo. Apropros of nothing . . . according to Du Nord, the rumors of Riquelme to the MLS have been flowing in the Argentine press. Come on Dynamo, let's find a way to get him, if the MLS can bend over backwards for LAG, they can give us a break too. DeRo getting warmed up . . .
Saprissa can't get it together on a corner. Right now, seems like Saprissa is controlling, but Dynamo have had a couple chances. Oh . . . get up . . . Hot, humid, this commentator needs help if he thinks that's an issue, this is a Houston team we're talking about. Dag, a transformer must have blown, lost power, and my DirecTV had to start up again, thankfully I didn't miss any goals. Still 0-0. Blown opportunity for Dynamo . . . Cheese and Rice, goal for Saprissa gosh darn it . . .
AA can kiss my . . .
Now I'm just despondent . . . I swear that the call of the goal has lasted at least 4 minutes on Costa Rica radio . . .
Man Costa Rican radio sports coverage puts American sports coverage to shame, all sports coverage that is. I don't know half of what they're saying, but it sounds exciting. . .
UGH . . . at least I can hear the Benny Hill theme on Costa Rican radio . . . I hate this friggin salary cap that the MLS has . . . no room for real depth when needed . . . Seriously, if the MLS wants to compete at the international level it needs to take the kid gloves off and allow teams to spend money on salaries. Saprissa gets 3rd goal . . .dag . . So, it appears that Saprissa and Pachuca will meet in the CCC final . . .
Com'on Garber, time to raise this stupid salary cap.